Last Wednesday, Drew Stafford and Tyler Myers were the major NHL roster players that the Winnipeg Jets received when that organization pulled-off a massive 7-player trade. 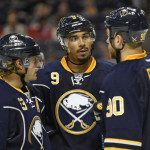 It involved perceived bad-boy, Evander Kane and Zach Bogosian finding new homes with the Buffalo Sabres.The trade was considered the biggest blockbuster in many years between NHL clubs. I can’t imagine the pressure to perform. Talk about excellent first impressions: Drew Stafford and Tyler Myers are fitting in nicely in Winnipeg. Sometimes the transition process can be slow, not in this case. 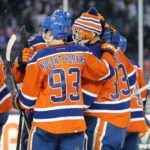 The pair was responsible for rescuing two points for their new club after a 5-4 win over the Detroit Red Wings on Saturday. Drew Stafford scored a goal in regulation and was credited with the shootout winner. While, Tyler Myers put up two assists. I’m looking forward to seeing the newest Winnipeg Jets in action tonight, against my hometown Edmonton Oilers. I know as a sports blogger you’re not supposed to be biased but I’ve always liked these two players and I hope they can get their careers back on track with this new opportunity. If you asked me, the Winnipeg Jets are the clear winners in the deal. Everybody in the National Hockey League knew the Jets’ organization wanted to get rid of, Evander Kane. Yet, Winnipeg’s general manager looked like a genius, securing the type of package every GM dreams of when dealing a star player: roster players, prospects, and picks. Drew Stafford and Tyler Myers are solid assets looking for a fresh start. And the early results are positive. Zach Bogosian was a well-liked man in the Winnipeg locker room with a lot of friends. Tonight, Bogosian makes his Buffalo debut. His impression could very well be a positive one as well I expected to flourish with the Sabres. Many hockey analysts suggest Buffalo received the most highly-skilled players in the deal. Which may be true… However if you have to babysit Evander Kane once he is healthy enough to be in your locker room the Buffalo Sabres could have their hands full. The 7- player trade between the Winnipeg Jets and Buffalo Sabres will probably be bigger than anything we see on trade deadline day. 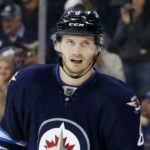 For the Jets the trade helps them now, and in the future with the prospects and draft picks they also received. Evander Kane is a highly talented player that wanted out of town. I think the decision to get rid of them as soon as they did will pay off for Winnipeg. However, as we all know, this is just the beginning. Trades like this could take years to determine a winner. Drew Stafford and Tyler Myers are fitting a nice with Winnipeg though.